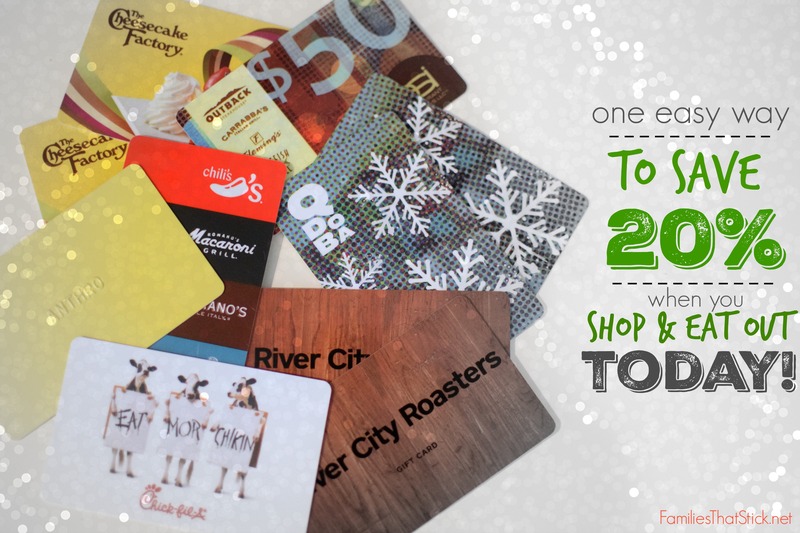 Reader Tip: How to Save 20% on Gift Cards! I was recently tasked by the parents of my daughter’s class to purchase a gift card for the teacher. I was originally going to spend the $100 I had received from the parents to purchase a $100 gift card. But, then I found a discounted eGiftCard online. The price was $79 for a $100 gift card. That’s a savings of 21%! Whoo-hoo! I loved being able to stretch those dollars a little farther so she would have more to spend. I was able to give her a larger gift card — and only spend $100!! I then realized, I’ve had “gift cards” filed under “gift ideas” in my brain. There is no reason I shouldn’t take advantage of these awesome deals, too! Also, I generally plan a least a day ahead when/where our family is going to eat out, and I know when I am going to go to a particular store to shop. Why not purchase an egift card and save that 5-20% right off the top? So, I searched for stores/restaurants that I regularly shop at…almost all of them were there, with substantial savings! Discount Gift Card sites have gift cards for Starbucks, Home Depot, Target and many more! The AMC Cards are 20% off, at the time of this post. That’s an awesome bargain, because last I checked, movie theaters weren’t offering sales! From now on, I am doing no shopping or eating out until I find out if they have a gift card online. GCSPREAD :: GCSpread offers both printable vouchers and actual gift cards, so you just need to be aware which kind you are purchasing. Especially, if you are in a time crunch and waiting for the mail is not acceptable. CARDPOOL :: This is a really popular site and is user-friendly. You may purchase physical or eGiftCards on this site. The turnaround for an electronic voucher is approx. 1 day. GIFT CARD BIN :: This is probably the biggest seller of discounted gift cards out there. They have an amazing variety of cards with great deals. GIFT CARD GRANNY :: Not as huge a selection as Cardpool, but great deals. RAISE :: This site looks sharp, and the nice thing about this site is they also offer an app, so you can purchase your eGiftCard from your phone. Remember, it can take 24 hours to receive your electronic voucher or egift, so you can’t purchase the voucher moments before making a purchase. I would say the discounts are not as deep as they are on GCSpread or Cardpool. EBAY :: There are people on Ebay who sell discounted gift cards. I did a quick search and a few deals popped up, such as a $100 gift card for $88. But, there were also sellers listing Target gift cards for the same amount as the gift card was worth + shipping. I have no idea why anyone would purchase this. Just be aware of what you are purchasing and make sure it is from a reputable seller. The downside for me would be wasting my time searching (& bidding) on Ebay when I could go to a dedicated discount gift card site, do a quick search and purchase immediately. I just found I had been charged $5 per quarter in our savings account for not updating our address — a loss of $35 because I didn’t realize it for so long! I don’t have our savings account at our regular bank because I don’t want to be tempted to use it… but that also meant I clearly didn’t look at it on any regular basis. We just let the money build. Then I found that even though the bank withdrew the money for my car loan in June, the payment was never actually credited to the car loan company — potentially a $400+ loss if I didn’t find it! 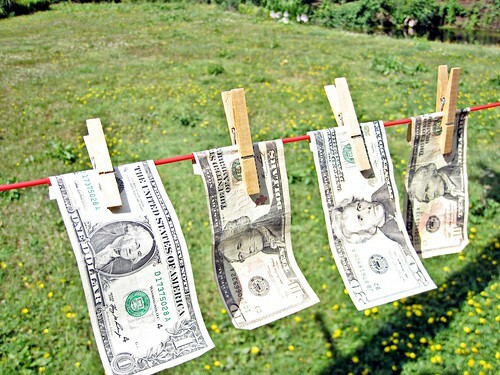 Again, with autopay, I saw the money go out and just assumed it made it to it’s destination – wrong! Check those accounts, my friends! Don’t let someone take your hard earned cash! I’m really lazy when it comes to couponing, but I’m always looking for ways to save money when I can. One way I’ve learned to easily save money is by purchasing discounted gift cards from Raise.com, using cash back websites for purchases, and using the “store pickup” feature. The idea is really simple. When I know what store I’d like to shop at, I head over to Raise.com to see what gift cards I can purchase with the highest discount. When I checkout, I then choose to have the gift card e-mailed to me vs having it sent by mail. That way, I receive my gift card in minutes and can use it instantly online or print it off to use at the store. After I receive the e-mail, I then head over to Ebates.com to see if the store I’m shopping at offers cashback for purchases made online. After finding my store through Ebates, I then go about adding the items to my shopping cart and I make sure to choose the “store pickup” option. 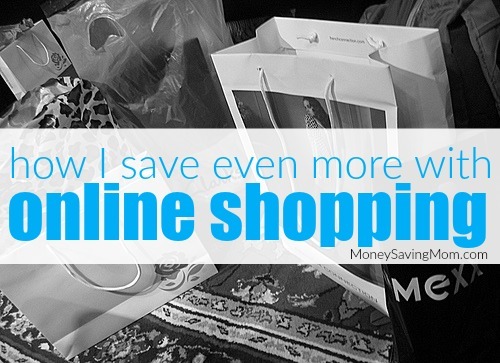 When I’m shopping, I also try to find items that are already on sale or already discounted so I save even more money. If the store I’m shopping at also has a rewards program, then it makes this even better because I’m able to accumulate cash back rewards for future purchases. I know about the lean years that Crystal talks about — I’ve had times when budgeting was an absolute necessity. Like Crystal, I’ve tried to continue a philosophy of frugality, even now that times are better. I’ve tried to adhere to a strict budget. In fact, I have a penny taped to the dashboard in my car as a constant reminder to “watch every penny”! Throughout the years, I’ve tried lots of different strategies for budgeting. I’ve tried the Excel spreadsheet idea, the envelopes with cash method, and the notebook with pockets system. But, what I’ve found most effective for my family is a modified envelope system. Throughout the week, I put the receipts from trips to the grocery store, Farmer’s Market, or restaurant visits in the Food envelope. I’m ever mindful of how the receipts are totaling up. In fact, throughout the week, I’m known to take the receipts out and add them up to see what’s left for the week. 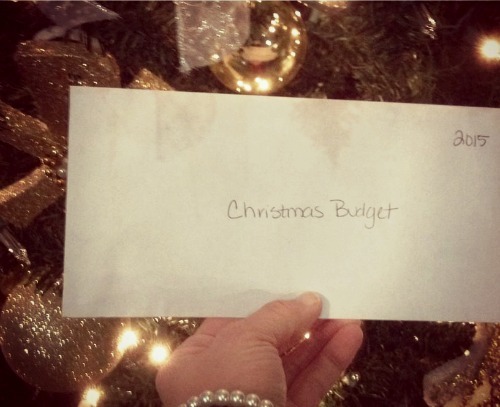 This modified envelope system can be especially effective right now with our Christmas gift budgets. I have an envelope labeled “Christmas” and a certain dollar amount budgeted for that category. When I purchase something from a store, I put the receipt into the envelope. When I order online, I print the receipt and add it to the envelope. I’m ever mindful of how much I’ve spent, and though I use my debit card, the receipts are accounted for and this helps me to keep a close eye on my spending. I hope this gives you yet another idea for staying on budget! And since I mentioned my “Food” category above, I thought I’d share my simple Winter Budget Menu booklet that I created for my family. Enjoy! Kathy Hutto is a homeschooling mother of two. She also serves as the Preschool Ministry Coordinator for her church. In her “free” time, she writes curricula and other resources for teachers. You can find her blogging at Kathy Hutto. My husband has been using the same deodorant for years, so when we find a good deal, we stock up! He recently opened a package of deodorant that I had purchased months ago, and to his dismay, the formula had changed. The cap was a different color, but other than that, there was nothing to signal us that something was different. Unfortunately, the new formula wasn’t as effective, and the scent was nowhere near as pleasant. I didn’t think I’d have much luck, but I reached out to the manufacturer to see if the old formula was still available. I was informed that it was entirely discontinued. But, instead of just being shrugged off by an enormous manufacturer (whose name is not synonymous with “customer service”), I was offered a complete refund for my entire stock-up purchase, no questions asked. 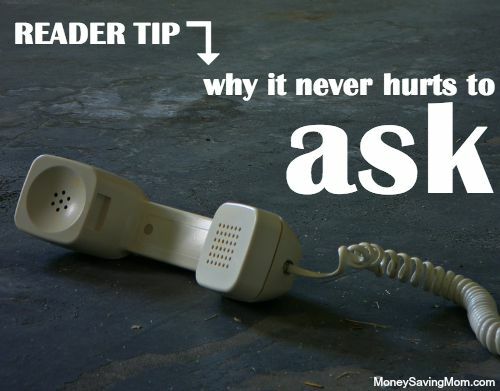 It just goes to show that it never hurts to ask! I saw your recent post about product review sites and thought I should tell you about Dollar Deal Reviews. It’s similar to Amazing Deals Group, but you can get more than 2 products at a time.